Russia is located in northern Asia. Russia is bordered by the Arctic Ocean; Azerbaijan, China, Georgia, Kazakhstan, North Korea, Lithuania, Mongolia, and Poland to the south; Belarus, Estonia, Latvia, and Ukraine to the west; and Norway and Finland to the north. Google Earth is a free program from Google that allows you to explore satellite images showing the cities and landscapes of Russia and all of Asia in fantastic detail. It works on your desktop computer, tablet, or mobile phone. The images in many areas are detailed enough that you can see houses, vehicles and even people on a city street. Google Earth is free and easy-to-use. Russia is one of nearly 200 countries illustrated on our Blue Ocean Laminated Map of the World. This map shows a combination of political and physical features. It includes country boundaries, major cities, major mountains in shaded relief, ocean depth in blue color gradient, along with many other features. This is a great map for students, schools, offices and anywhere that a nice map of the world is needed for education, display or decor. 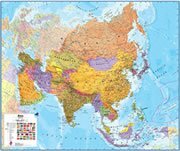 If you are interested in Russia and the geography of Asia our large laminated map of Asia might be just what you need. It is a large political map of Asia that also shows many of the continent's physical features in color or shaded relief. Major lakes, rivers,cities, roads, country boundaries, coastlines and surrounding islands are all shown on the map. Aldan, Angarsk, Apatity, Astrakhan, Balagansk, Baley, Barnaul, Bratsk, Chelyabinsk, Cherskiy, Chita, Irkutsk, Kazan', Klyuchi, Kolpashevo, Kostroma, Kozhva, Krasnoyarsk, Kurgan, Kyzyl, Mogocha, Moskva (Moscow), Nadym, Nizhniy Novgorod, Novorossiysk, Novosibirsk, Okha, Omsk, Orenburg, Oufa, Penza, Perm, Petrozavodsk, Pevek, Ryazan, Salekhard, Samara, Sankt-Peterburg, Serov, Smolensk, Sokol, St. Petersburg, Stavropol, Strezhevoy, Surgut, Tambov, Tara, Tarko-Sale, Tiksi, Tomsk, Tulun, Ulan Ude, Ust'-Kamchatsk, Ust'Kut, Vladivostok, Vologda, Volograd (Stalingrad), Vorkuta, Yagodnoye, Yaroslavl, Yekaterinburg, Yuzhno-Sakhalinsk and Zeya. Aldan River, Anadyr River, Angara River, Arctic Ocean, Barents Sea, Bearing Sea, Beloye More (White Sea), Black Sea, Caspain Sea, Cheta River, Chukchi Sea, Culym River, Cuna River, East Siberian Sea, Greenland Sea, Indigirka River, Irtys River, Jana River, Jenisej River, Kama River, Kamskoye Vadkhr, Kara Sea, Khrebet Cherskogo, Kolyma River, Kotu River, Laptev Sea, Lena River, Marcha River, Norwegian Sea, Ob' River, Obskaya Guba (Gulf of Ob), Oka River, Omolon River, Onezhskaye Ozero, Ozero Baykal, Pecora River, Ryinskoye Vadkhr, Sea of Okhotsk, Taz River, Ural River, Verkhoyanskiy Khrebet and Volga River. Russia has an extensive amount of natural resources. These resources include major fossil fuel deposits of oil, natural gas and coal. The country also has timber and many strategic minerals. Russia has numerous natural hazards. These include volcanoes and earthquakes on the Kamchatka Peninsula, and volcanic activity in the Kuril Islands. In addition, there are spring floods and summer/autumn forest fires throughout Siberia and in parts of European Russia. 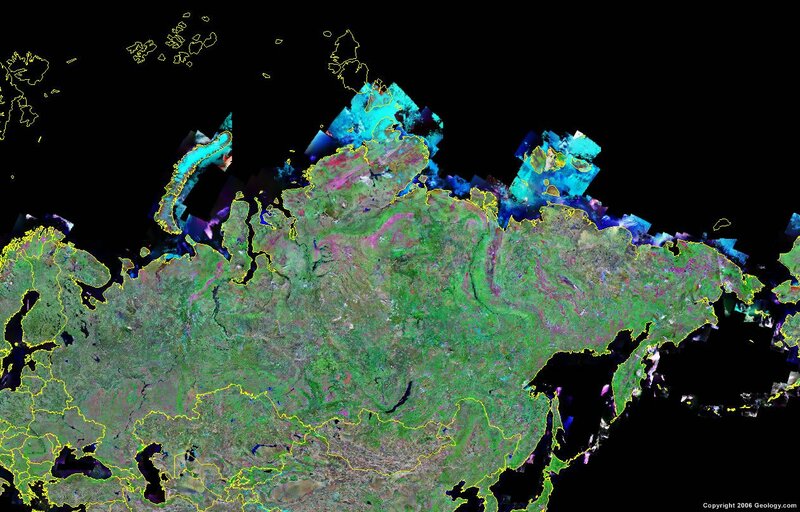 Permafrost is a major obstacle to the development of most areas of Siberia. Russia has numerous environmental issues. Issues concerning the land and water include: deforestation; soil erosion; contaminated soil from improper application of agricultural chemicals; stocks of outdated pesticides, which have been abandoned; scattered areas of radioactive contamination (sometimes intense); lack of urban solid waste management; groundwater contamination from toxic waste; pollution of the inland waterways and seacoasts, due to agricultural, municipal, and industrial effluents. The country also has air pollution from heavy industry, the emissions of coal-fired electric plants, and transportation in major cities.